It’s time again for the BC & Alberta Guide Dogs Poinsettia Sale, our second annual. It’s a chance to decorate your home or workplace for the holidays and support our vital programs – breeding, raising and training Guide Dogs for individuals who are blind/visually impaired, Autism Support Dogs from children aged three to 10 with profound autism and PTSD Service Dogs for military and RCMP veterans with Post-Traumatic Stress Disorder. 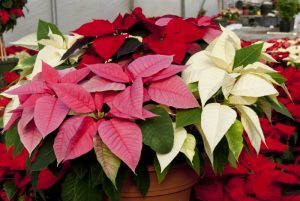 We are selling 6.5-inch Poinsettias in red, pink and white, gorgeous holiday planters and beautiful and fragrant wreaths. The deadline for ordering is Nov. 25 and flowers, wreathes and planters on Saturday Dec. 8 at the BC & Albertas Guide Dog office (7061 Ladner Trunk Road in Delta) from 10 a.m. to noon. The flowers, planters and wreathes can be ordered online. Your support is greatly appreciated. Any questions, please email guidedogfundraiser2017@gmail.com or Call Pauline at 604-788-5496.